How did I get into this page anyway ? Well, you probably share a common interrest in video games in general and PAC-MAN especially. Or, you're just curious what this is all about. So what IS the main target here ? 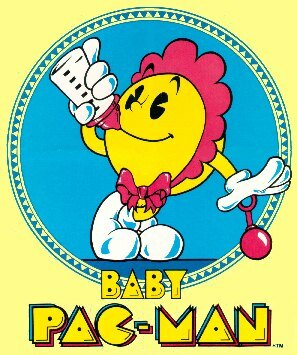 In fact, this page is dedicated to PAC-MAN and all variants of this electronic game. You will find tricks and tips, rare stuff, high scores, cheats and other relevant information here. 1. StartYou start off with 3 Pac-Men. 1 more Pac-Man is gained at 10.000 pts. (this is the most common game settings, but other configurations are also possible) Your goal is to navigate the maze, eating the dots tha are spread all over. You have 4 different direction to move Pac-Man (up-down-left-right) using a joystick. When the first stage is cleared (all dots are eaten up) you go on to 2. stage and so on. After the 2., the 5., the 9., and every 4. stages above the 9.stage, there is an intermittent pause. A cartoon is being played back, showing Pac-Man in different battles with the ghosts. To make life a little bit more complicated, there are 4 ghosts chasing you all over the maze. If one of them gets at you 1 life is lost. The game is over when all Pac-Men are eaten up. 1. Stage Cherry 100 pts. 2. Stage Strawberry 200 pts. 3. Stage Orange 500 pts. 4. Stage Orange 500 pts. 5. Stage Apple 700 pts. 6. Stage Apple 700 pts. 7. Stage Grape 1000 pts. 8. Stage Grape 1000 pts. 9. Stage Ice compot 2000 pts. 10. Stage Ice compot 2000 pts. 12. Stage Stewed fruit 3000 pts. 13. Stage Key 5000 pts. Pac-Man 1980 The first and original ! So, you really want to cheat, huh ? Ok. Let's do it the fair way, shall we ?. No rules broken, are you ready to master the game ? The new miscellaneous page is up ! � Pac-Man with legs ! Click here for the Miscellaneous page. to making this page more interresting for You. More information is to emerge in the future. Bookmark and visit regularily for updates ! Wanna play a cool Pac-clone game ? Please try the spectacular PacGuy : HERE !